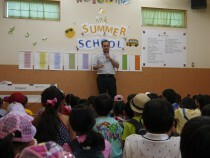 Summer School has begun! All the students came to the gym and met all the teachers. We also did a safety talk: What to do if… sad or upset. What to do if an earthquake happens… And let's have fun and use English!